I wish I can be more eloquent but I can only say this - I'm excited!!! "... a world leader of innovative hydration, reflective, and multisport gear and accessories. Nathan's line of race belts and vests, bladder packs, handhelds, runner's packs, bottles, and reflective vests and accessories continue to help athletes of all levels redefine humanly possible. 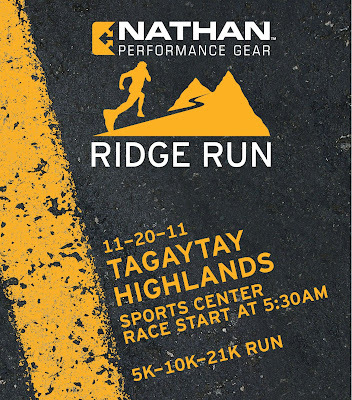 Available in specialty running shops, sporting goods stores, and over 35 countries worldwide, Nathan Performance Gear is a subsidiary of Penguin Brands, Inc."
It will be held within the confines of Tagaytay Highlands where the weather is cold and the roads are steep. :P It's a destination road run which enables you to travel conveniently, meet new friends and get some real exercise. Plus eating is so much more heavenly after an intense physical activity. I'll be joining the 21 KM event just so I get to see more views. Plus, I have this mantra/creed/whatever you call it - "The greater the distance, the bigger the appetite!". Ahooooo!!! I recommend that you subscribe to their fan page on Facebook for more updates about this event. It's going to be amazing! I wish I can share more but I am not allowed - just yet. Or, if you treat me to a dim sum buffet maybe I can afford to lose a friend :P . Hahaha! See you there!